Gust Equity Management allows companies to generate paperwork for issuances in a single flow. When creating your security (Common Stock, Preferred Stock, Option Pool etc) you will see a section titled ' Documents Shared With Grants'. 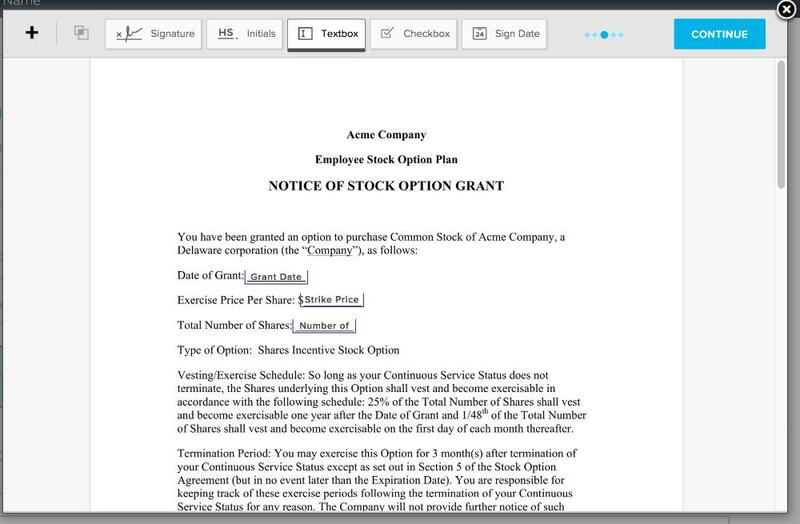 This is where you can add supporting documents for a particular issuance and even create your option agreement. Start by adding all the documents you want to share. Clicking Make Template will open up the document and allow you to mark it up with 3 different types of text field. Me (now): any text you always want added to the document. Gust Equity Management (when sending): these are a preset range of fields (Grant Date, Strike Price, Units etc.) that Gust Equity Management will auto-populate for you. We'll use the underlying transaction to fill them out when you go to send the document. Recipient: where your recipient signs, dates, adds their name etc. The only requirement is that your recipient has to complete at least one field to make the document receipt legally binding. For any fields you want to add to the document that Gust Equity Management doesn't auto-populate (say Employee Title), you don't need to do anything at the template creation stage. We'll give you a preview of the generated document before you send at which point you can modify any field as well as add extra ones. Once this is done, whenever you go to issue new grants/purchases we'll offer you a check box to generate the documentation and share. You'll then get one final opportunity to check the document being sent, and make any alterations you wish. Your recipient will receive an email alerting them of the new grant and prompting them to login to Gust Equity Management (no private company information is included in the email). The recipient will have all the attached documentation in their account as well as a personal view of the transaction which will allow them to track their holdings over time. ***If you have already created your security without adding the documents simply go to the securities page, select the security you are wanting to add documents or create an agreement for and click on EDIT SECURITY to do so. You'll never lose your legal paperwork again!